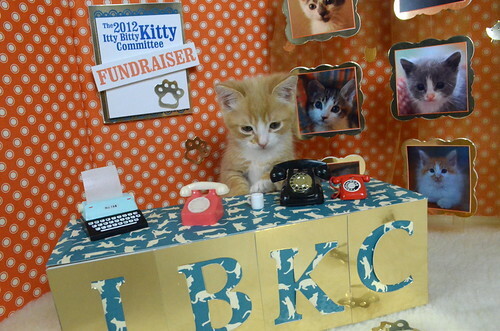 The Itty Bitty Kitty Committee: Phone Lines are Now Open!! The 2012 IBKC FUNdraiser Has Begun!! Phone Lines are Now Open!! The 2012 IBKC FUNdraiser Has Begun!! On Saturday, July 21st, we'll be participating in Dog-A-Thon, our Humane Society's walk for homeless pets. For those of you who are new to the blog, it's a really exciting time of year at the IBKC, and we all work very hard to raise money for this event to support our shelter. It really is a whole lot of fun - there's lots of extra pictures and extra posts. You'll see the whole IBKC community rise to support our shelter. It will make your heart feel happy. You'll witness lots of very kind and generous people in action. You'll cry happy tears, and in the end, we will have raised squillions of dollars to help homeless cats and kittens. It's magical. The first year we participated in the event, we started off with a modest goal of $3000. By the time we were done, we raised $23,000. Our minds were blown. The next year, we upped our goal to $40,000, met that goal with our online donations and when we added in the money collected from our other team members, friends, family, and auctions we had raised over $48,000 for the shelter! Year three we raised the bar again and set our goal at $50,000. By the time we were done, we had raised a remarkable $66,000! With the funds raised last year by the IBKC, the shelter was able to build the “Petunia Louise Community Cat Room,” a ten by eight foot glass-walled enclosure with climbing trees, privacy boxes, and lots of soft places to sleep. Showcasing the cats in a more home-like setting is proving to be very attractive to adopters, and the kitties don’t usually stay long! Later, I'll be sharing a little bit more about the room and post some pictures too. This year, we are raising the bar once again and have set our goal at $75,000. Did I just say that out loud? Yes, $75,000. But I know we can do it. All of the money raised by the Itty Bitty Kitty Committee Team will go directly to the cats and kittens. Every single penny of it. It will help fund the foster program and in-house and off-site adoption programs. It will help make shelter improvements for the cats. It will buy cats cozy little fleece beds. It will help reduce the cost of spay and neuter surgeries for pets of lower income families. It will feed and provide medical care for tiny kittens, adult and senior cats. It will also help fund a brand new program at the shelter designed specifically to help elderly pet owners on fixed incomes, who can’t afford to feed their beloved companions. The majority of these seniors own cats, and don’t have transportation. They are planning to add a delivery program to bring cat food to these seniors in need. This helps keep cats in loving homes where they belong, and out of the shelter. 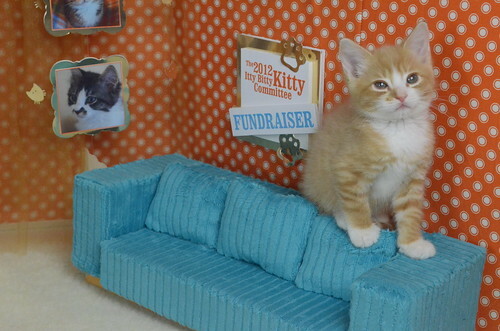 Just like previous years, we'll be auctioning off the naming rights to a litter of kittens. Our new litter just arrived, and as soon as we get everyone introduced, we will begin those auctions. It's always exciting to follow these auctions and even more exciting to find out the names selected by the winning bidders. You can win a chance to name a kitten too. Every time you make a donation, your name will be entered into a raffle, and one lucky donor will get to name an Itty Bitty Kitty from an up-coming litter! There will be a few other give-aways too, which we'll announce later. Of course we'll also be auctioning off another "Tea with The Bean", your opportunity to have lunch with Charlene and kittens. The tea has been a huge success the past two years, so we have to do it again! Last year we did a huge art auction, and auctioned off several pieces by the many artistic folks in the community. Although it was a whole lot of fun, it was just too much work to do while running this gigantic fundraiser too. We will do it again, but not at the same time as Dog-A-Thon. Instead, I've hatched another plan to bring you all some art. We've been working with an awesome local artist, Boo Davis, to create a beautiful kitty-themed, limited edition silkscreen print which will be for sale in the IBKC shop. All of the profits from the sale of the print will go right to our fundraising campaign. I know last year, our art auction prices went sky-high, so many of you missed out on purchasing a piece. I thought this would be a good way to bring art to the masses while being kind to your pocketbook. I'll have more details on the print soon. We're still working out the details on it now. But I know you'll love it. Boo's work is outstanding! Just you wait, my friends! I've got so much planned for the next month. There are going to be LOTS of fun surprises, lots of extra pictures and posts, and I think this is going to be the best Dog-A-Thon yet!!! I know, I say that every year, but it really does get better each time! The telethon set is complete, and our first round of phone bank operators have arrived. OH MY they are an adorable little group. Seriously, you all are going to FLIP when you meet them all. There are five total, and each is unique and equally adorable. This sweet little orangey on set is a boy. He's just getting warmed up, but he's bright, and I'm sure he'll master the phones soon! These little kittens we've fostered for the shelter have given so much to us. Think of all the times their lovely little faces have brightened your day, and made you feel better. Let's honor these kitties by supporting the organization that gave them their start in life, The Humane Society for Tacoma/ Pierce County. 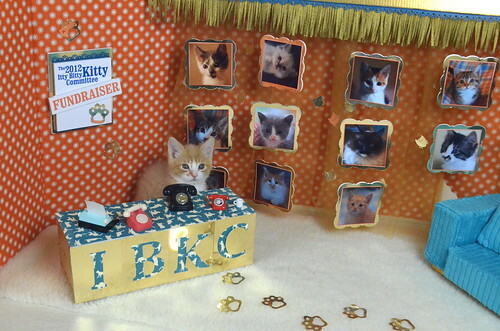 To help us reach our goal, and make a tax-deductible donation, please pay a visit to the IBKC FirstGiving webpage by clicking HERE. Thank you, friends. I can hardly wait to see how this unfolds!!! And I can hardly wait to see the difference we'll make in the lives of our precious shelter cats and kittens. Thirty-one days, $75 Squillion! WE CAN DO IT! PS I know that not everyone is in a position to make a financial donation, but you can always help by spreading the word! That's free and very powerful! Even in miniature, the cats hang out on the top of the couch. Are you kidding me with that first picture?!!! How adorable is the FUNdraiser set, and that phone bank employee!! Is that insanely adorable typewriter new, Laurie? Or did I miss it in past years? In either case, it's a truly brilliant addition to the FUNdraiser set! Had to come back when I saw this post. And how cute is that little couch? Agree - cat on back of couch - obligatory. Also, can we do Paypal this year? Yes, we'll have that option soon. Is the site having problems or is it just me? When I hit the submit button it waits for a long time then apologizes and tells me it can't reach the next page. They are working on it! Just got off the phone with them. Not a problem! It took seven tries but my donation finally went through! Oops, there is a problem! I just checked my credit card statement and I was charged seven times for my donation! Looks like the web site was borked but the transactions still went through! If anyone else tried to make a donation and got a wonky web page error, you may want to check your statement to see if you were billed multiple times! Wow - that time of the year already??? We will have to raid our allowances and make a donation!! Each year, Laurie makes an amazing, adorable tele-athon set, but this year you've really outdone yourself!! Squee! The typewriter, the couch, the alumni pictures on the wall! It's all so adorably cute. Let's raise squillins! Second picture caption: "I'm gonna need a bigger cup of coffee." Yay! Squillions!!! And the set *is* cute -- Laurie - where is the kitty paper from? Must. Have. Passing the word on now. Best of luck. Love your ginger little helper! I'm off to call this adorable little orange fellow to make my pledge. I can hardly wait to see his brothers and sisters--I'm sure they're equally cute! Thanks for the good work you do, Laurie! 75 squillion, here we come! I made my donation just fine--no technical glitches. Maybe it's already been fixed. I must commend this little orange fellow on his phone skills. He was polite, professional, and personable (or would that be "kittenable"?). He will go far! He looks mighty purrsonable to me! "Purrsonable" is purrfect! I wish I'd thought of that myself. LOVE the new telethon set especially with the typewriter, the alumni photos, and the blue couch! Is there an alumni picture of Geraldine on the wall? How cute is that little fellow and the new set? You are so creative that I'm always surprised. Will you be auctioning off one of Craig's watercolor images of Charlene Butterbean? Or will that be in the art auction? He will probably do something. Not sure what though. What, no sparkle ball garlands to distract the phone opurrators this year? Oh my! First day and I already have happy tears! Love this time of year! Oh my . . . I do so love orange boys. AWESOME way to start and love the set! I love the new program the shelter is starting: A pet food assistance and delivery program for seniors with pets. That's so totally wonderful on many levels, keeping furry ones in homes, etc. Let's raise squillions! So important for our elderly friends to be able to keep their babies. I so clearly remember the light in my dear sweet Grandma's eyes when the pets came to visit. What a lovely idea! Am I the only one who keeps coming back to the photo to identify all the little faces on the wall? I see Kisses picture on the alumni wall. Still remember how sweet she was. I think that might be Pearla, not Kisses. I love the idea of helping elderly people to stay in their homes with their kitty kats!! One of the rich pleasures of life and this will just make it soooo much easier. LOL at the hover over caption on the couch picture.